12 Years A Slave won the best picture award last night at the Oscars. Lupita Nyong’o took the best supporting actress award for her portrayal of the slave girl Patsey and John Ridley won for the screenplay. This cinematic depiction of slavery has focused attention on the strength of our African-American community — its survival in the face of raw and unrelenting brutality — and it is above all else a story with the power of truth. 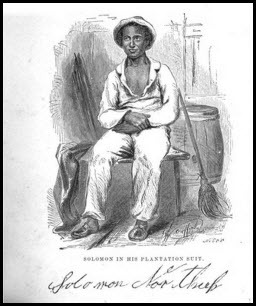 With just a little effort, today, you can find Solomon Northup’s story. It’s a story worth reading, in its long form, and with all its constituent pieces. What you won’t find, at least not yet, is the story of Patsey, the slave girl, after Solomon Northup was rescued. And that, by itself, is a story worth reading. Because, in so many ways, it is the story of today’s African-American genealogists and their own struggles in trying to find their roots. And even with help and input from some of America’s top experts in Louisiana research, including genealogist Elizabeth Shown Mills, Calautti couldn’t find out what happened to Patsey. What can be found of Patsey’s story. The story of research into slave ancestors. Required reading for us all. 12 Years a Slave very much deserved its Oscar for best picture. It is a very powerful and moving film which I think everyone ought to see. I find it quite extraordinary that no has been able to find a record of Solomon Northrup’s death or burial, even though he died at a time when death records and burial records should surely have been available. We weren’t quite as up to date with death records here on our side of the Atlantic, Debbie. There are record gaps here right into the early days of the 20th century. These are the complexities that African American Research deal with on a daily basis and not understood by the wider Genealogy community. Our techniques are somewhat different. Documentation is lost and has been stolen and hidden in many homes across this Country. It was a intentional confusion. We, now all must be a part of piecing our lost History together. If the African American History is not just OUR respondsibility. It’s the Whole Genealogy Community as well. If that part of our History is not Spoken or Told everyone else’s story is not complete. I think they’re understood more than you might suspect, True, and as DNA shows more and more than we’re all cousins at a genetic level the understanding is growing by leaps and bounds. When I first heard of the movie “12 Years a Slave”, I dug out my “Roots” DVD’s, just to refresh my memories. I didn’t realize it was about 8 hours long, my genealogy friends and I watched 4 hours one night and 4 hours the next. Next week a group of us are going to see “12 Years a Slave”, for some of us this will be the second time. Roots was certainly one of the most powerful television presentations ever done by that time, Gus. But because of the vast scope and the need to comply with the mandates of the TV medium, I suspect 12 Years A Slave may end up as a more powerful piece overall. You’ll have to let us know what you think. Did the descendants of Solomon Northrup derive any monetary gain from the movie, 12 Years A Slave? Most likely the answer is no. Should had Brad Pitt, Steve McQueen, Lupita, Searchlight Pictures and others at least set up an endowed scholarship fund Northrup descendants? The consensus “do right” answer to that question is most likely yes if they truly wished to honor the legacy and memory of Solomon Northrup. However, I will give credit to Lupita Nyong’o for attending a Northrup family reunion in NY in July 2013 where she said: “We had this responsibility to bring these people back to life for the wider world to see.” With her acting ability and sentiments such as this she deserved the Oscar she won. Like Lupitia, some times, each of us needs a little piece of soap to remind us to volunteer our talents to assist an African American in need of Genetic Genealogy guidance and expertise. The story was clearly in the public domain, so I suspect the answer is no. No more than Abraham Lincoln’s relatives would have benefited from a movie made today about his life. Spoken eloquently by a person seeing the world narrowly with legal tinted glasses. I am not talking about what’s legally right here … but rather what is morally right. And specifically what is morally right and just for Northrup’s descendants, some of whom are note below. I think they may have a different opinion with what portends to be “just” and being cast 100% in the public domain versus being “morally just” and beneficial for their private family domain. Granted that this is a human soul story of Solomon Northrup, a deceased African American person, whose story indeed has long been in the public domain. However, the descendants of Henrietta Lacks, also a deceased African American person, with a human tissue story, did recently obtain some moral justice and financial benefits. Apples and oranges. The Lacks case was one where information affecting living people — children of Henrietta Lacks — was disclosed without their knowledge or permission. Without question they needed to be brought into the decision-making process — and that’s all that was done. Absolutely no money was provided to the Lacks family, just the right to have some control over dissemination of private information. That’s a huge difference from the Northup case, where the nearest living relatives are (I believe) great great grandchildren. OK. Would you an out of court settlement involving a Apples – Oranges – Pears? Now back to the Solomon Northrup case. Do you think a scholarship fund for his descendants is one of the morally right things to do? Your source confirms what I understood to be the case: no money involved in the Lacks case at all. And what I do or don’t think is morally right is utterly irrelevant. My personal opinions don’t drive business decisions by others.